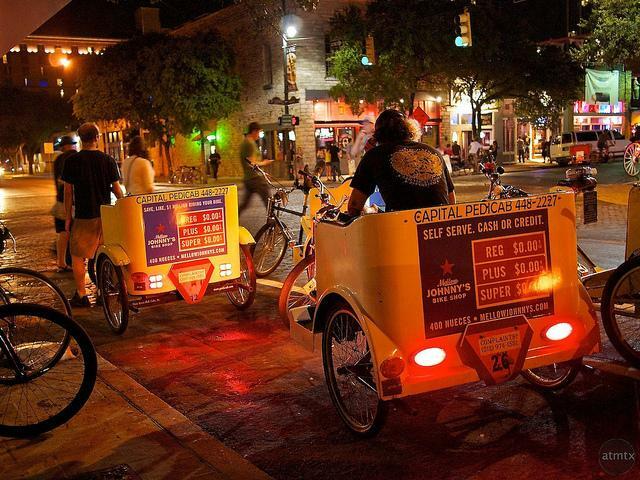 While the city regulates and considers improvements to pedicab services, no new permits will be issued for six months. Capital Metro announced today that it has received $38 million from the Federal Transit Administration to help cover the cost of the MetroRapid program. 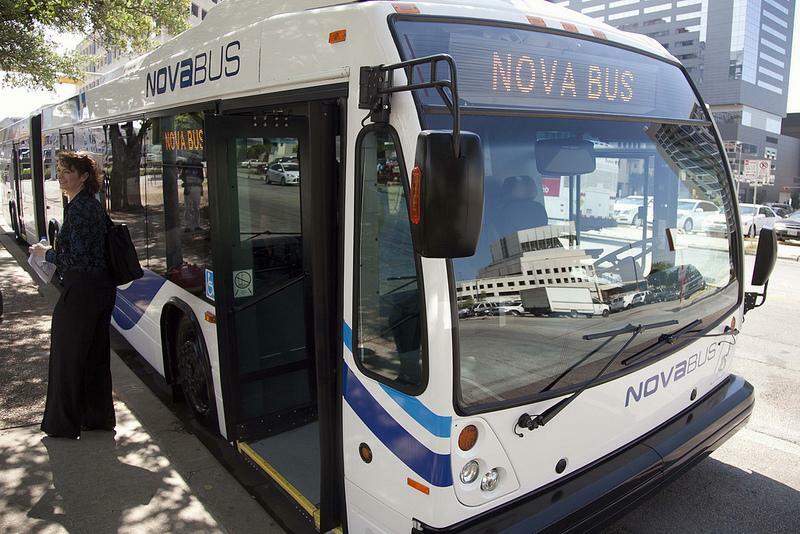 The funds come from the administration’s "Very Small Start" program and will cover about 80 percent of the program’s $48 million cost, said Linda Watson, the president and CEO of Capital Metro. More Parking Meters Coming to West Campus? 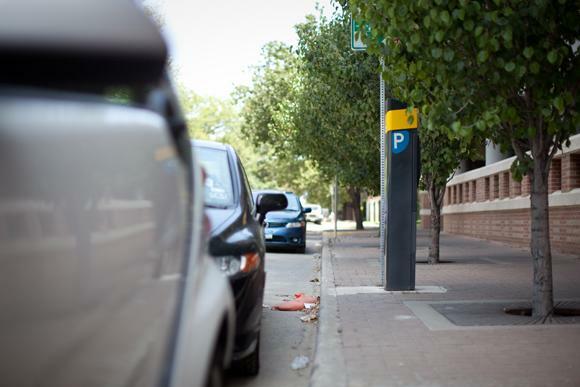 The City of Austin may soon install additional parking meters in the West Campus area. 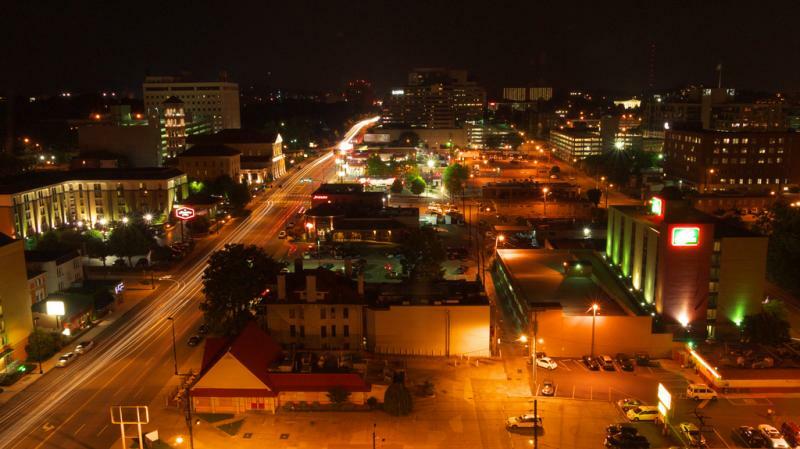 University Area Partners, a West Campus coalition of businesses, property owners and neighbors, has requested that meters be installed to relieve traffic congestion in the area. 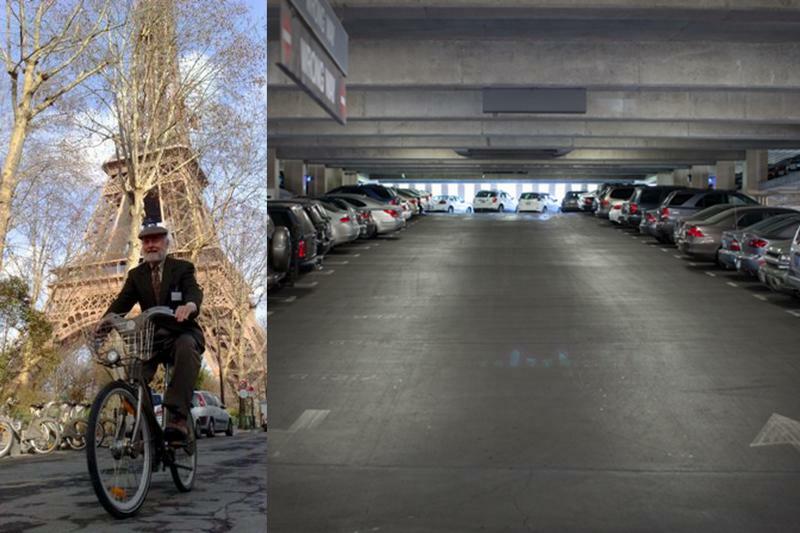 Property owners say students and UT employees who park there causing a parking shortage. Brian Donovan, who chairs the association’s parking committee, says the meters will allow access for more drivers. There will soon be some changes at Capital Metro. Riders probably won’t notice but many drivers and mechanics will. Capital Metro is required to change its labor structure after the Texas legislature passed a law, Senate Bill 650, last May that basically requires transit workers to either become state employees or become employees of a competitively-bid private contractor. To receive federal transit funding, Capital Metro employees initially needed to retain their right to collective bargaining, but the requirement was at odds with state law prohibiting collective bargaining and the right to strike for public employees. 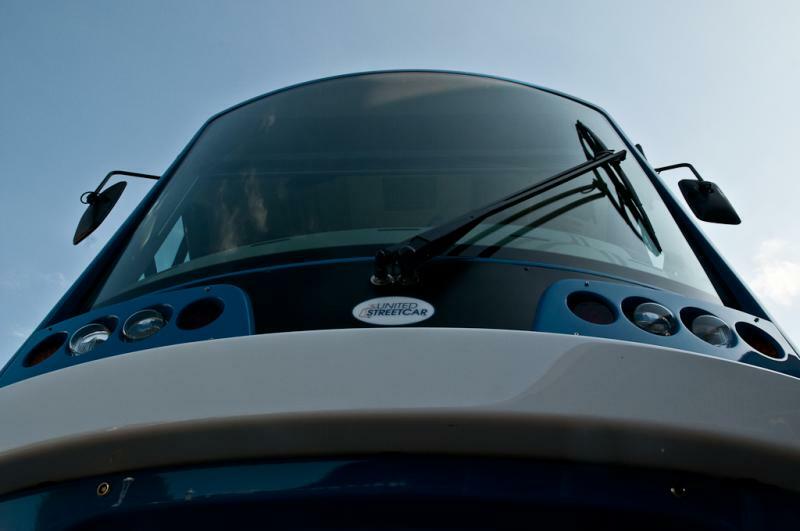 A third-party, StarTran, was installed to resolve the impasse – but SB 650 did away with that arrangement. 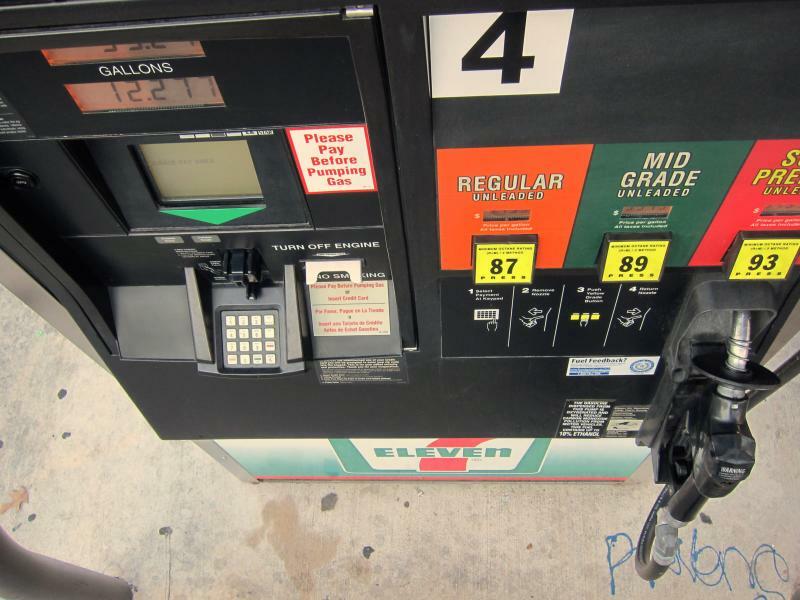 Gas prices are on the rise nationally, and Austin is no exception. The price of gas in Texas has gone up another six cents this week, to $3.82 a gallon, according to AAA’s Fuel Gauge Report. That's up 25 cents over the last 4 weeks. The price spike mirrors one hitting the entire country. But gas here is still a dime cheaper than the national average. Austin customers pay $3.75 at the pump, up from $3.58 a month ago. Today, the Texas Transportation Commission approved 80 mph speed limits on two Central Texas highways. The limit has been raised on the nine mile stretch of State Highway 45 South, from Interstate Highway 35 to US Highway 183. Heading west, SH 45 turns into SH 130, and the 80 MPH designation continues for 45 more miles, all the way to IH-35 in Williamson County. 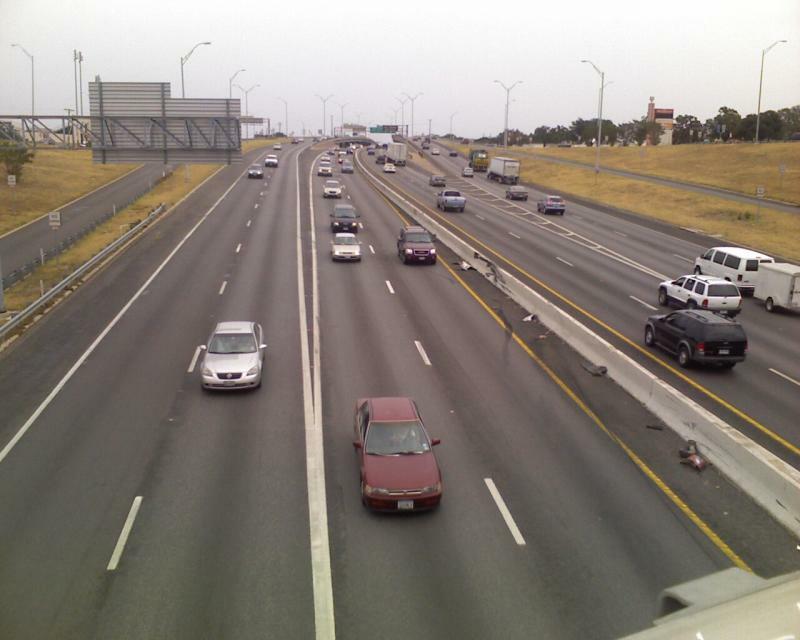 Could a Congressional Showdown Crash Texas Transportation Projects? A dispute over federal transportation funding has some state and local governments worried. But the Texas Department of Transportation (TXDot) says if funding dries up, Texas can float construction costs for up to three months. 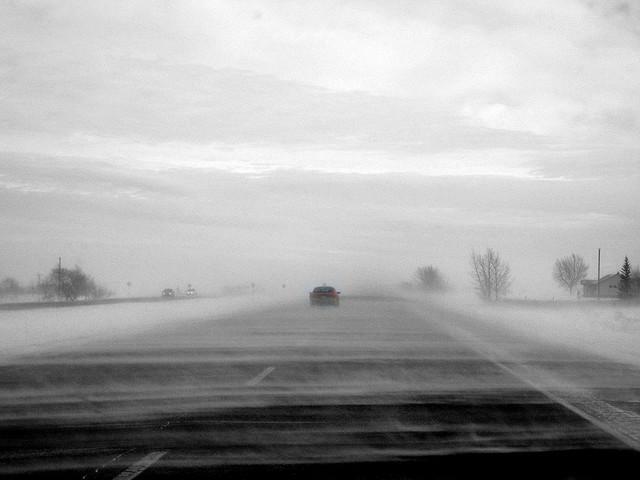 The U.S. Senate passed a $109 billion transportation bill nearly two weeks ago. But since then, the measure has garnered little traction in the House, as Republican legislators have rallied behind an alternate budget with deeper spending cuts, according to Washington DC journal The Hill. As of this writing, the House just passed a 90-day extension of transportation funding. Should the Senate approve the same measure, it will prevent federal funds from hitting the skids this Saturday. In an effort to improve pedestrian safety and calm traffic, the city’s putting the squeeze on South Congress. Construction starts today on an eight to 12-month project to “bulb-out,” or extend curbs on streets intersecting South Congress, shortening the crossing distance for pedestrians from 90 feet to 57 feet. The bulbs will take the form of concrete islands providing "pedestrian refuges," according to the city. Of course, construction means traffic delays. The city states “One lane of traffic will be closed on S. Congress in the area where the contractor is working and one lane of traffic will be closed on the cross-streets with detours for the cross-streets.” Does that mean the bulbs are calming traffic already? 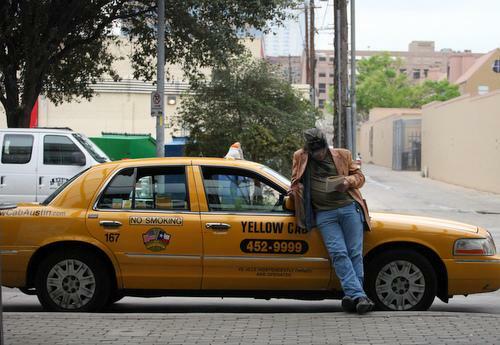 Time to Change How Austin Allocates Taxi Permits? How should the city decide how many taxi permits to issue? Believe it or not, Austin actually has a formula. And it’s not terribly arcane either, like the number of UT home games multiplied by number of South by Southwest venues divided by new Eastside dive bars. Instead, there’s a longstanding equation, last revisited nearly a decade ago, that the city uses to assess how many cabs it should have on the streets. But that equation may change beginning this week. 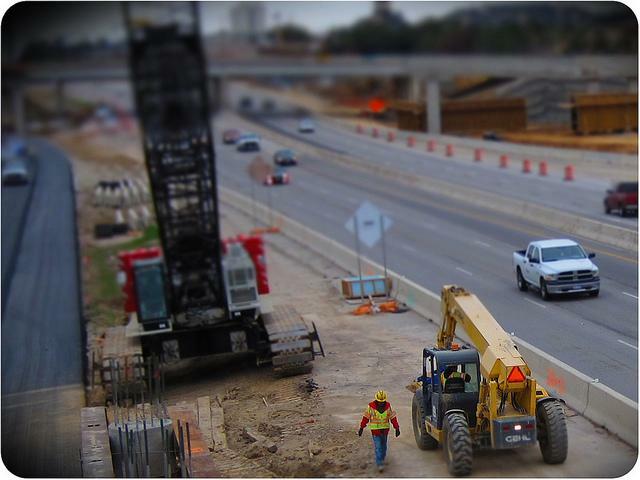 The Austin-American Statesman writes about the City of Austin’s continuing efforts to improve highway traffic through its I-35 Corridor Development Program. 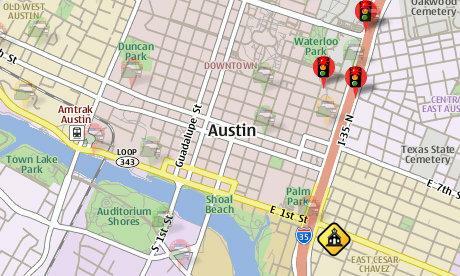 City of Austin voters approved funds in November 2010 for studying high traffic corridors in the city. Those studies would address short- and medium-term transportation improvements, including several intersections with I-35. Capital Metro’s Red Line will start running late into the evening on Fridays and Saturdays. Austin City Council voted 6-1 this evening on this resolution directing city staff to finalize the deal with Cap Metro. Kathie Tovo was the only council member to vote against the proposal. The new schedule will see commuter trains run hourly from 7 p.m. until midnight on Fridays. On Saturdays, they'll run every 35 minutes 4 p.m. until midnight. That schedule takes effect Friday, March 23. Oil prices have jumped sharply in the past two weeks, and the price of gasoline is also moving up. Across the country, a gallon of regular costs nearly $3.60 on average, with some areas facing $4 gas. That's causing sticker shock at the pump, and concern that rising prices could derail the economic recovery. 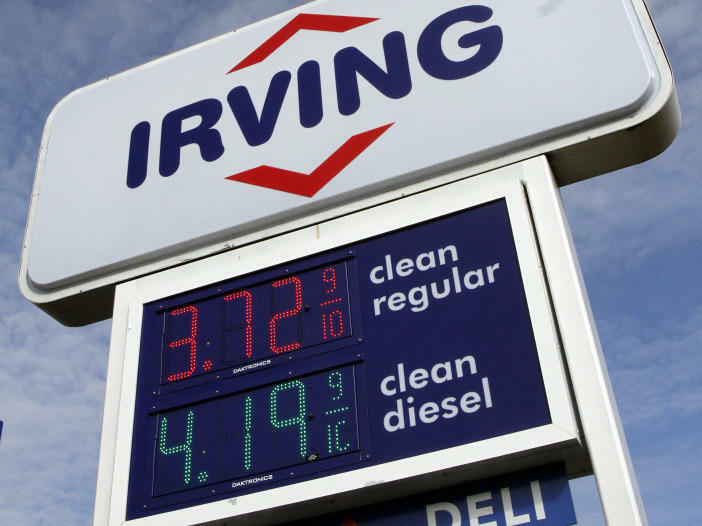 According to Daniel Yergin of Cambridge Energy Research Associates, gas prices are up because of the West's current confrontation with Iran and sanctions over that country's nuclear program. Have you ever opened your mail and found a traffic ticket sticking you with a not-so-small fine? If so, your reaction might well have been, "What the [expletive]?" Then maybe you looked carefully at the enclosed photo and realized the vehicle shown (allegedly) running a red light or speeding was, in fact, yours. Downtown revelers will need to take extra precautions this Fat Tuesday. Several street closures are in effect this evening, while Austin Police have announced the holiday means another “No Refusal” action where police can subpoena and draw suspected drunk drivers’ blood. As seen in the map detail above, full closures are in effect on all the side streets off of Sixth, between the southbound I-35 access road and Brazos, starting at 9 p.m. Neches, from Sixth to Seventh street, will also be closed starting at 5:30 p.m. You can view a full map of the closures on the city website. Could rush hour gridlock turn into relaxation time for Texas drivers? University of Texas researcher Peter Stone and his fellow project members at UT’s Autonomous Intersection Management (AIM) project have been receiving attention with a provocative concept: creating “smart” intersections linked to intelligent autos that will enable cars to drive themselves. Stone’s research was recently presented at a meeting of the American Association for Advancement of Science. Stone is no stranger to automotive technology; five years ago, he was part of a team that responded to a development challenge from the U.S. Defense Advanced Research Projects Agency (DARPA) to create a vehicle that could pilot itself. 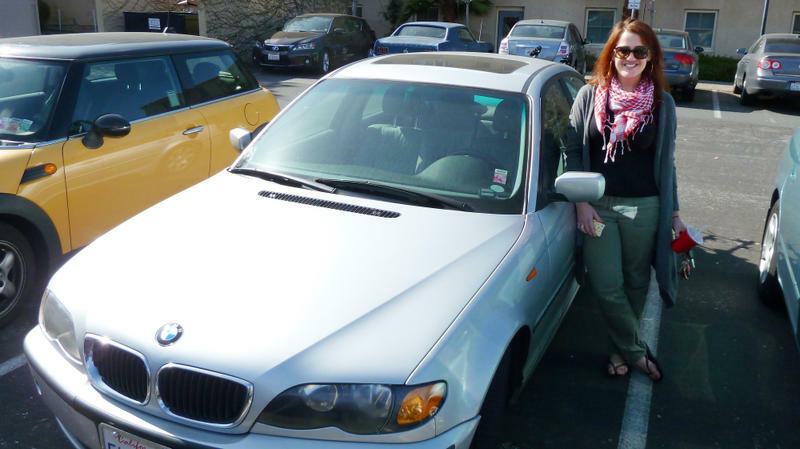 “Since then, in 2007, we’ve had a car which can drive itself,” Stone says. 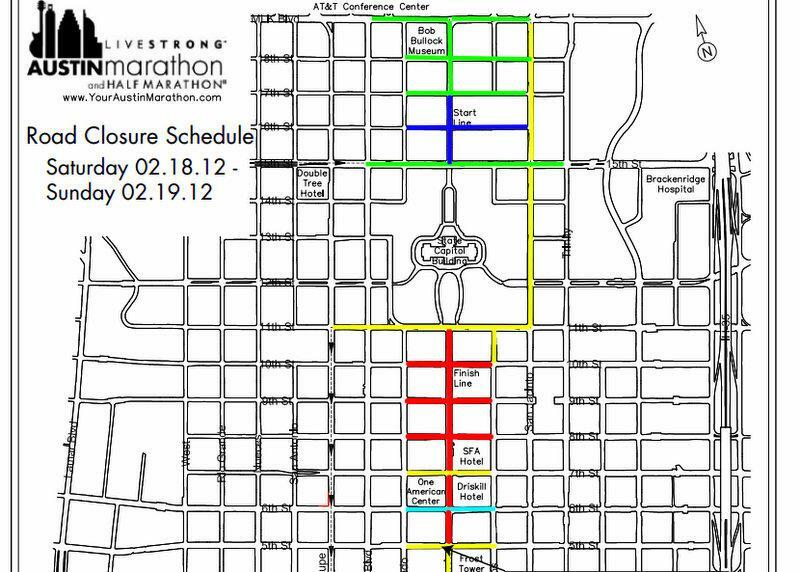 The LiveStrong Austin Marathon gets underway this Sunday, and the race means several street closures in the urban core. 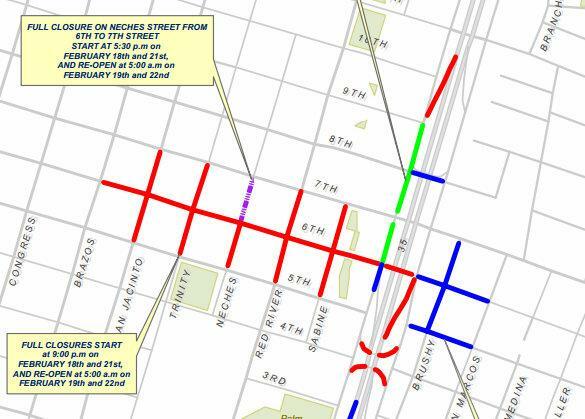 The earliest of the closures -- the red lines marked in the map above, which you can also view and download online -- affect Congress Avenue and several side-streets between 11th and 5th street. Those closures begin Saturday, Feb. 18, at 4 a.m, and will extend until 6.p.m on Sunday. Here in Austin, we’re used to appearing in a ton of Top 10 lists. 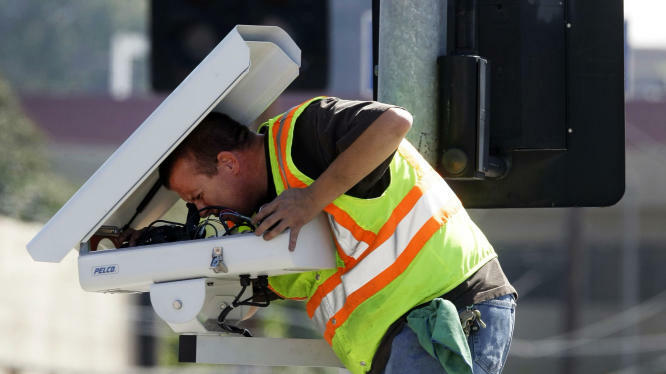 But here’s one honor we might not be too excited about: Austin has been named one of ten American cities with the most speed traps. Will 45 New Taxi Permits Make a Difference To Passengers? Or Drivers? 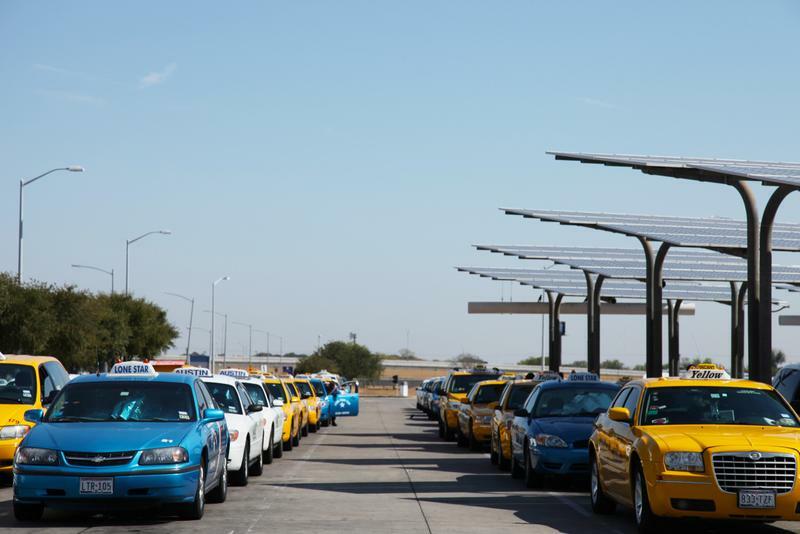 More taxicabs may be hitting Austin's streets, but not anytime soon. Last night, the City Council approved additional permits for cab companies: 30 for Lone Star Cab (which would bring its total to 88), and 15 for Austin Cab (bringing it to 177). However, the approvals were on first reading only; council must approve the change on three readings, which may occur concurrently. And even then, it takes 60 days for the permits to take effect. 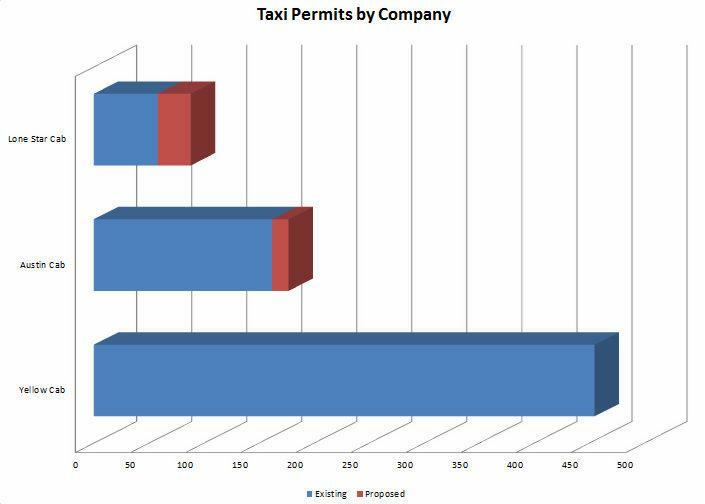 As shown above, should Lone Star and Austin Cab receive the additional permits, their numbers will still be eclipsed by Yellow Cab, which controls 455 permits: so many, in fact, it's technically prohibited by city ordinance, which states a company may not possess more than 60 percent of the city's permits. 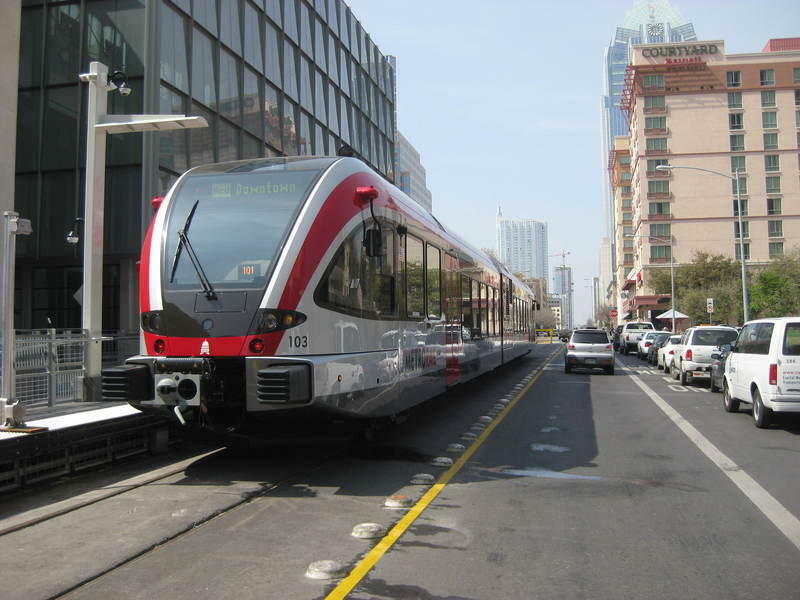 The $2.2 Million Question: Expand Cap Metro Rail Service? 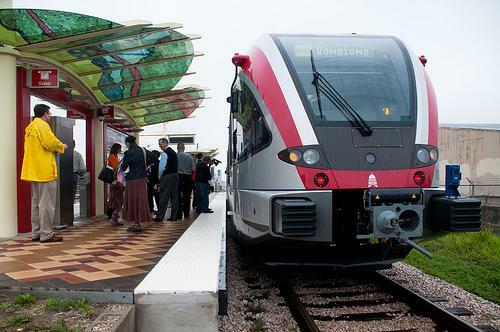 Plans to expand Capital Metro’s rail service haven’t enjoyed a smooth roll-out. The transit authority told KXAN yesterday its plans on launching weekend service on its MetroRail commuter line during this spring’s South by Southwest festival. The soonest any formal action could occur on the proposal is next week. At their Feb. 9 meeting, city council is slated to take up an item providing for the extra funding. The cost of expanding Friday rail service into the evening and running the service on Saturday is tallied at $2.2 million annually, with two optional year-long contract extensions. Here’s another reason not to over-imbibe: If you get sick in a taxi on the way back from Sixth Street, you could get hit with a $100 dollar fine. 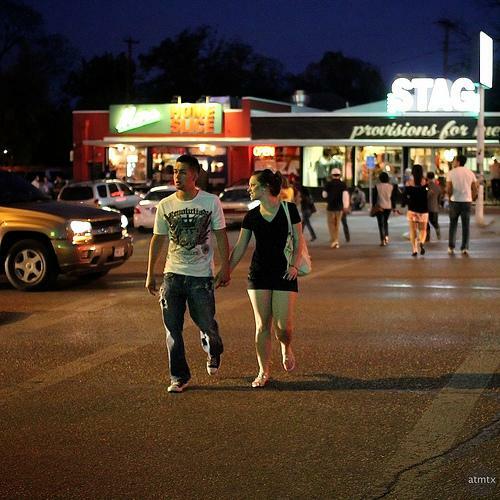 That measure is one of two proposals coming to the Austin City Council tomorrow. Item 42 creates the clean-up fee. If passed, it directs City Manager Marc Ott to draft “recommendations for implementation and enforcement strategies for a $100 taxicab clean-up fee” – i.e., how and when the fee will be collected. 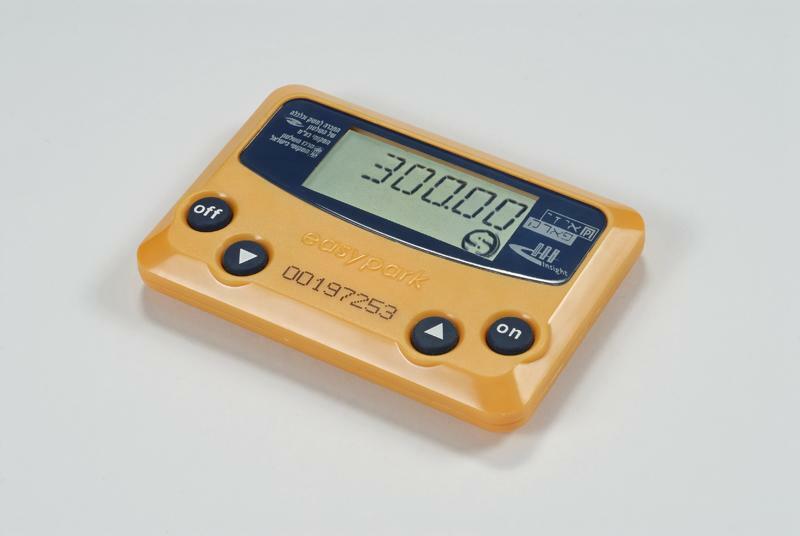 It will also implement the new rule quickly, by Feb. 9. There’s a second cab-related measure up too: Item 43, which would implement a “peak hour surcharge” on fares. Between the hours of 9p.m. and 4:30p.m., fares would be charged a flat $2.50 surcharge. The new fees are an outgrowth of complaints council regularly hears every time a taxi-related measure comes up: that it's difficulty to make a living as a cab driver. New signs are in place at Capital Metro bus stops around town. But instead of a list of times, they feature an identification number for that specific stop, and information on how to learn more about the next bus arrival. The signs include a quick response (QR) code , which people can scan with their smartphones to open a mobile website containing upcoming arrival times for that individual spot. It’s a technological step forward for Capital Metro, which is in the process of installing site-specific signs at each of its 2,700 bus stops around Austin. However, the times Capital Metro displays are the set, static times the transportation agency displays in their schedule books. Real-time information on bus arrivals and departures are still some two years away, the agency says. The price of gasoline continues its downward slide ahead of the holiday travel season. More than 7.5 million Texans prepare to travel 50 miles or more for the holidays, according to a AAA survey. A gallon of regular unleaded is selling for an average of $3.04 in the Austin-San Marcos metropolitan area, AAA’s Fuel Gauge Report says. That’s a decrease of five cents over the last week. It’s 12 cents less than the price a month ago. But gas prices are still higher than they were this time last year, when a gallon of regular unleaded sold for an average of $2.81 in the Austin area. The lowest gas in the city as of this posting is selling for $2.88 at three locations off Research Boulevard in North Austin, according what people have reported to AustinGasPrices.com.